It feels like a bit of fall is in the air. The nights have been cooler, we had 47 degrees this morning, and the days take longer to warm up. Of course, the sun is setting earlier which shortens the amount of time outside. Today I am walking out along the middle riparian areas starting with Outlet creek. Then I will cross over to Davis Creek if it does not get too hot! It feels quieter this time of the year. There is a low singing that happens as if the birds are trying to be quieter. This may be while the young birds are learning their songs and mating is over so the territoriality is no longer driving them to sing their loudest. This does not mean every bird is being quiet because as I walk along I do hear loud birds calling. Today these are mostly raptors, or birds of prey, Red-tailed Hawks, Red-shouldered Hawks, and White-tailed Kites. 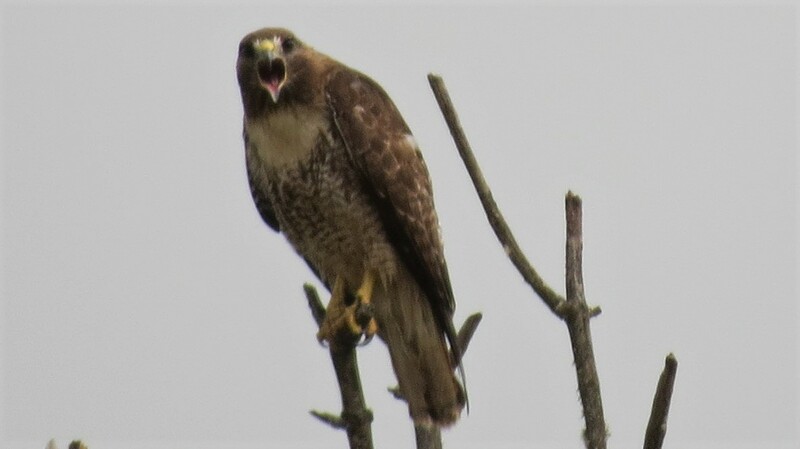 It seems that every time I come through this particular field a Red-tailed Hawk, Buteo jamaicensis, scolds me loudly. 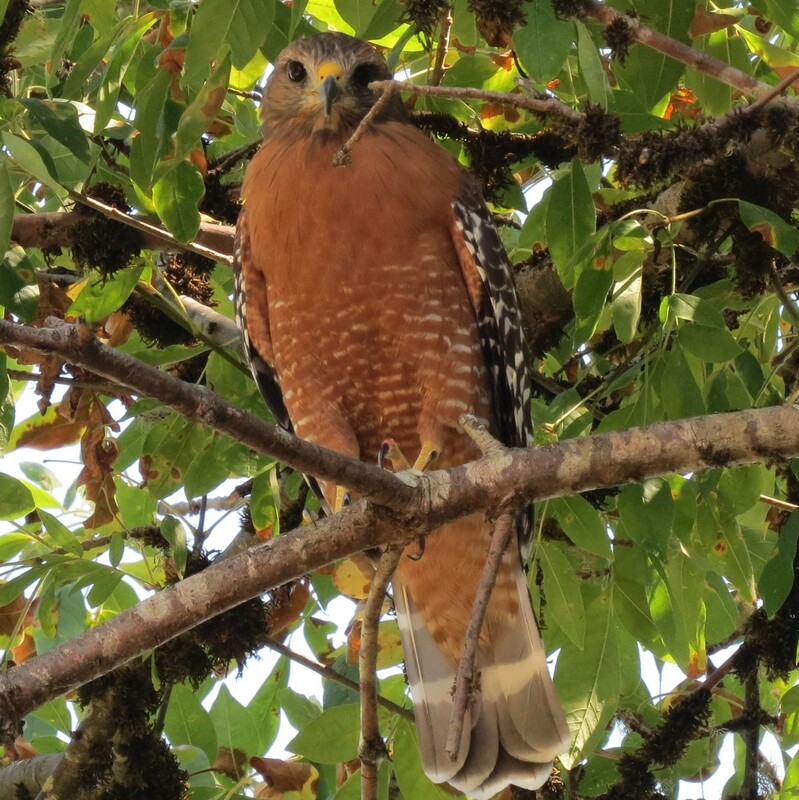 This familiar hawk is always a thrill to see, with its broad wings and reddish-brown tail. There is at least one pair in the Little Lake Valley and I feel lucky to see them regularly. They eat a varied diet that includes, small mammals, birds, and reptiles. I have seen them with snakes in their talons and even seen photos of one catching and eating seagulls. This one finally stops its screaming at me and flies to the north. 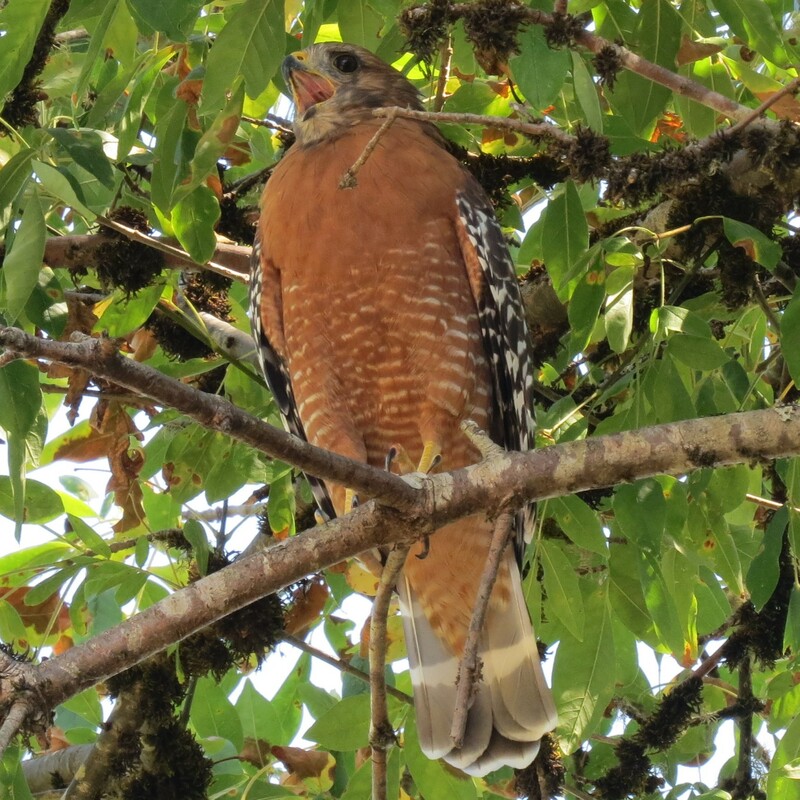 It is shortly after that as I am walking in the creek bed that an adult Red-shouldered Hawk, Buteo lineatus, lands in a tree right above my head. Their calls have been all around me as I have made my way along the creek. This one also begins screaming at me and I smile at my luck! The smaller birds are chittering their disapproval of this visitor, many different varieties of them call out. It also just continues calling loudly until it notices me and fixes me with an intense stare. I appreciate its beautiful red chest and black and white wings. Many times I have seen these hawks hunched over on a utility line over a busy road looking straight down as though a mouse will be running across the road any minute. Besides small mammals and birds, this hawk eats amphibians, reptiles, and as I mentioned in another blog, crayfish! I even heard about one eating tomato hornworms from a friends’ tomato plants! As I leave the creek bed and move out into the grassland another bunch of screaming calls catches my attention. Off in the distance, I can see a trio of white birds with black shoulders flying in a circle. 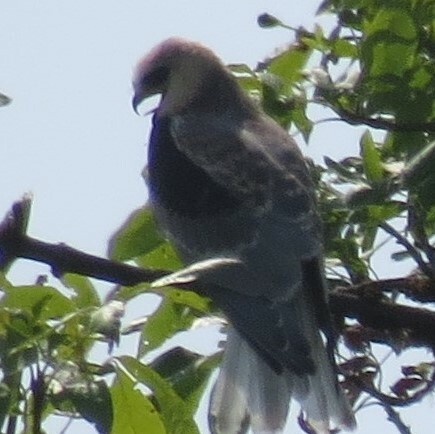 They are a family of White-tailed Kites, Elanus leucurus. One is crying loudly, a sound that reminds me of a raspy, high whistle. When I check it out with my binoculars I see that it has rusty red streaks on its neck and chest which means it is an immature or juvenile bird. It lands on a tree and continues its cries. At least it is not screaming at me! The adult Kites get the young one up in the air and the circling begins all over again. Well so much for a quiet day in the valley. The world is full of surprises and is endlessly entertaining if one just takes the time to look around! The afternoon has begun to heat up as I head for the cool shade of the Ash trees.